Mr. Ford couldn’t have said it better himself. Gerald E. Bruce, the award’s namesake, was a close friend of Mr. Ford and one of The Ford Family Foundation’s founding directors. He envisioned a future where Ford Scholars were not only successful in their careers of choice but also acted as volunteers and civic leaders. The Foundation is seeking applications and nominations for the annual Gerald E. Bruce Community Service Award for Ford Scholar Alumni who are pillars in their community as entrepreneurs, philanthropists and role models for future generations. Nominations may be submitted on behalf of one’s self or that of a fellow Ford Scholar from the Classes of 1994 through 2005 by Nov. 11, 2014. The selected recipient will receive a plaque and a $5,000 grant to a non-profit organization of their choice at the Ford Scholars Recognition Conference in Eugene on June 20, 2015. Visit the Ford Scholar Alumni Association website for the nomination form, www.FordScholarAlumni.com, under the “Get Involved” tab. Call the Foundation Scholarship Office at 877-864-2872 or e-mail fordscholarships@tfff.org if you have questions. 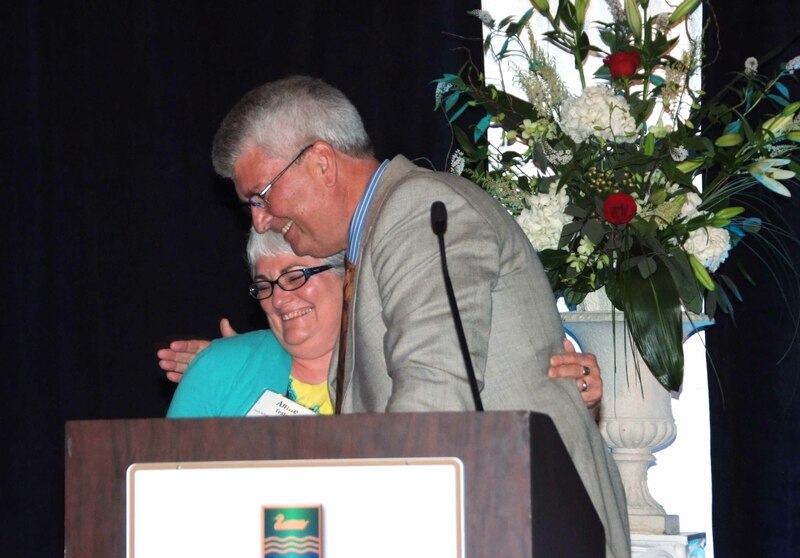 Class of 1994 Alumna Annie Tester gets a hug from former Ford Family Foundation President Norm Smith as she accepts the Gerald E. Bruce Community Service Award during the Recognition Conference at the Eugene Valley River Inn on July 12. Tester earned the award for her dedication to her small, rural hometown of Pilot Rock, Ore., and her perseverance in building a charter school.